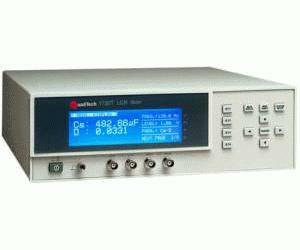 The QuadTech 1730T LCR Meter is an easily programmable, microprocessor-based high performance passive component tester with excellent low impedance measurement and fast measurement speeds even at 100/120Hz. It measures 16 different parameters with a basic accuracy of 0.1%. Programmable test frequency, speed, mode and voltage permits great versatility in component and materials testing. Standard IEEE-488 and Handler interfaces provide data transfer and component automation applications for faster production line testing.